Preheat the oven to 375 °F (according to phyllo pastry sheet package instructions). Add the leeks and sauté for 5 minutes, stirring constantly so they don’t burn. Incorporate the collard greens, season with salt, pepper, and nutmeg, and cook until soft (about 5-10 more minutes), stirring well. Turn off the heat and let the vegetables cool. When the vegetables are ready, mix in the goats cheese. Take out 1 pastry sheet from the package and stretch on a clean kitchen counter. Using a brush or your hand, cover the top surface of the sheet with a layer of melted butter. Take out another sheet and place on top of the first one, pressing softly so they stick together. Cover the second layer with butter too. Cut the sheet in 6 long strips of equal size. Place about 2 tablespoons of the dough, shaped into a golf ball, at the edge of each strip. Fold the phyllo into a small triangle, covering the collard and leek filling. Fold again in a different direction, maintaining the triangle shape. Continue until you have folded all the dough into a perfect triangular empanada. Repeat with the rest of the phyllo strips and filling. Place the empanadas on a baking tray, side by side, without touching. 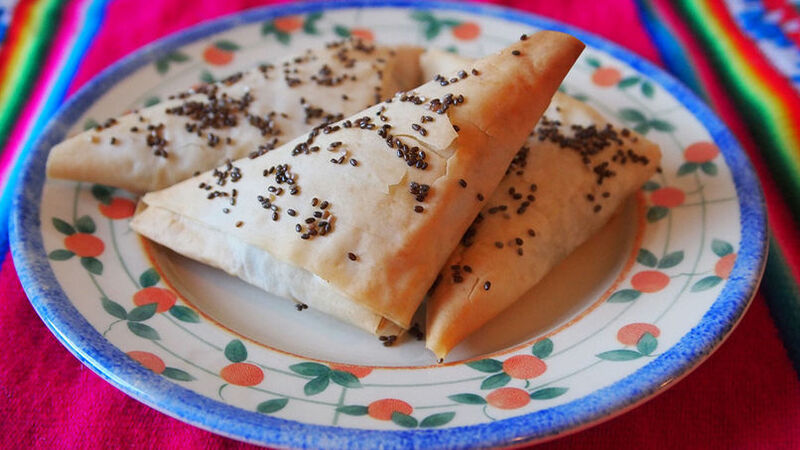 Cover the top surface of each empanada with melted butter, and sprinkle with chia seeds. Bake for 20-30 minutes (according to phyllo pastry sheet package instructions). If the empanadas are not golden brown yet, put them under the broiler until ready. In Peru we serve chard tart sprinkled with lime juice. You can serve these empanadas with a few wedges of lime to recreate this traditional dish. Instead of phyllo, you can use regular empanada dough or discs. Peruvians and Latinos in general are crazy about empanadas. The bigger kinds are served as appetizers, snacks or even as a light meal on the go, and we also make smaller versions with all kinds of fillings to serve as hors d’oeuvres at parties and family gatherings. The traditional empanada in Peru is made with minced beef, but there are many vegetarian variations that, although they aren’t as traditional, are equally delicious. Some of my favorites include cheese, artichokes, spinach, or meat alternatives (in place of the minced beef). The empanadas I have prepared today are inspired both by the aforementioned spinach empanadas, and by one of my favorite Peruvian appetizers: chard tart. I didn’t use these ingredients but instead prepared a mixture of collard greens and leeks since I wanted to make an original and seasonal rendition of these two recipes. Enjoy!